I talked a little about the production in an earlier post, but I have included some further details after the jump. For a long time, the free culture world has lacked a decent set of orchestral samples. 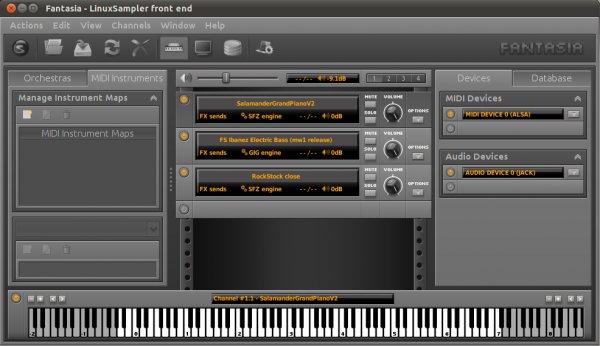 Various projects have produced or compiled samples of instruments, but often just in their raw form, requiring the user to assemble them in to something useful. It would take a hell of a lot of work to pull in samples from these various sources and turn them in to not just usable instruments, but a usable collection of instruments with a consistent sound, but that’s exactly what Mattias Westlund and some helpers have done, in the form of the Sonatina Symphonic Orchestra. SSO (as I’ll refer to it) covers all the basics: the common brass, woodwind, and string instruments, in sections and as solo instruments, with a few important articulations (like staccato and pizzicato notes on the violin sections, for example), along with piano, chorus, and percussion instruments. They’re all bundled in to a single 440MB download (via BitTorrent) with a Creative Commons Sampling Plus licence, and the instruments themselves are all in SFZ format, so they’re compatible with the current LinuxSampler development code from CVS. Now, at 440MB, it’s not going to rival VSL (it’s individual instruments are several times as large! ), but it’s far better than anything I’ve heard from the traditional free options, such as the Fluid GM library. The demo on the SSO website is well worth a listen: it does show the library’s limitations at times, but it also shows just how good it can sound. Scoring believable orchestral parts is as much in the programming as it is in the sounds themselves, but SSO gives us all a solid, Linux-compatible base to work from. One last word on Linux compatibility — some of the SFZ files in the collection play a bit loose with the cases on the filenames of the samples they link to, which causes problems when loading them in LinuxSampler. The authors are aware of the issue and I’m sure it’ll be addressed before the next release, but for now, I’ve uploaded a complete set of corrected SFZ files. Extract those over the top of the SFZ files from the distribution, and you shouldn’t get any trouble from LinuxSampler. It may be the silly season, but I’ve still had plenty of time to work on a new track. It’s coming along well I think, but it’s been quite a challenge, mainly beacuse it’s a very “back to basics” track, with a minimal, piano-based arrangement. You’d think that would make things easy, but it’s quite the opposite! With just a few instruments in the mix, the quality of the performances and mixing, and the authenticty of the sounds, will be paramount. With Pianoteq taking care of the piano, the drums have been my main focus so far. My first instinct was to load up Hydrogen, sequenced from Qtractor, with one of the few big Hydrogen kits around. The Big Mono kit from Analogue Drums sat nicely with the feel of the track, but they’re recorded in mono (as the name suggests), and they have a lot of room sound, too. They also push Hydrogen hard — with 210MB of samples loaded, it needs 400-500MB of RAM to run. If I wanted to go with even better sounds, Hydrogen wasn’t going to work. The answer, then, was LinuxSampler, which laughs heartily at gigabyte-sized sound sets. I took the plunge and spent a whole $25 on another Analogue Drums kit, called RockStock — it has more drums than Big Mono, and they’re all recorded in stereo, with separate close mic and room mic recordings of each. Thanks to some third-party SFZ mappings, it works beautifully in LinuxSampler, and despite having 870MB of samples, it uses just 200-300MB. One question in using LinuxSampler that I haven’t quite answered yet is how I’m going to mix it, since there’s no way to get separate per-drum JACK outputs from it. You can load the same sound set in to LinuxSampler multiple times, though, with little additional overhead, so there’s nothing stopping me from loading RockStock five or six times for each of the different drums I want to use. Those separate instances can then be routed to separate JACK outputs. I just need to make sure that I split my MIDI drum tracks up in the same way. I have some basic drum parts written, using just two groups of drums (kick/snare/toms, and hats/cymbals) routed to two instances of RockStock in LinuxSampler, and it’s sounding pretty good — not quite there, but hopefully not too far off. With more attention to detail in the programming (it feels like I’m slowly learning the drums, just without the drums! ), and some appropriate treatment in the mixdown (EQ, compression, etc. 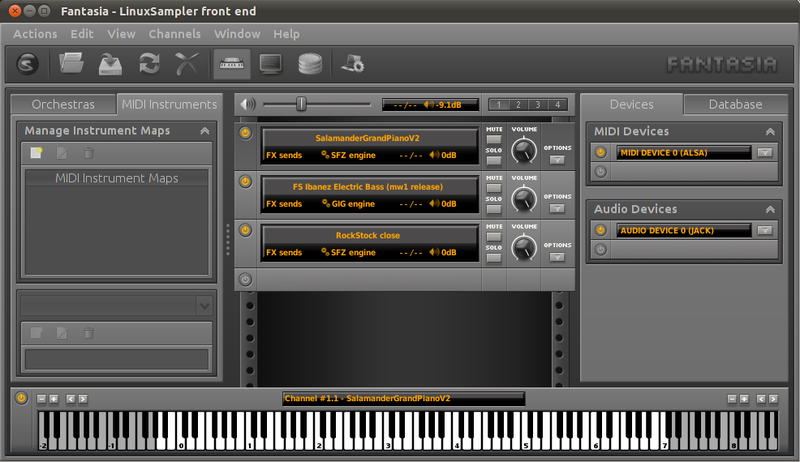 ), I think I’ll be able to produce some solid, convincing drum parts.